Steady state lasing with colloidal quantum dots an important step toward practical lasing technology. Scientists have developed a method for creating laser light using colloidal quantum dots. University of Toronto and Los Alamos National Laboratory developed the technology, with partners from Vanderbilt University and University of New Mexico. “This work brings us a step closer to the next important goal – the demonstration of lasing with electrical pumping, at which point colloidal quantum dot laser diodes will become a technological reality,” said Victor Klimov. LOS ALAMOS, N.M., March 20, 2017—A multi-institutional team of researchers from Canada and the US has demonstrated steady state lasing with solution-processed nanoparticles called “colloidal quantum dots,” an important step on the path to improving laser tools for fiber optics, video projectors and more accurate medical testing technology. The work is reported today in a paper for the journal Nature. “This work brings us a step closer to the next important goal – the demonstration of lasing with electrical pumping, at which point colloidal quantum dot laser diodes will become a technological reality,” said Victor Klimov, a Los Alamos National Laboratory participant in the present project and principal contributor to the original demonstration of the quantum dot lasing effect. The new studies prove the feasibility of steady state lasing with colloidal quantum dots and provide practical guidelines to make them even better as optical-gain media. Improving quantum dot lasing could produce better tools for detailed, cellular-level biochemical analysis, and take video projectors to a more efficient level than the current LCD versions. “They [quantum dots] are more than five thousand times smaller than the width of a human hair, which enables them to straddle the worlds of quantum and classical physics and gives them useful optical properties,” said project lead Ted Sargent, a professor in The Edward S. Rogers Sr. Department of Electrical & Computer Engineering at the University of Toronto (U of T). The research team includes the University of Toronto as a lead institution, Los Alamos National Laboratory, Vanderbilt University, University of New Mexico, National Research Council of Canada, and the University of Ottawa. For Los Alamos, the research connects to the institutional mission of solving national security challenges through scientific excellence, in this case focusing on novel physical principles for highly efficient light sources, charge manipulation in exploratory device structures, and novel nanomaterials. Semiconductor quantum dots are tiny specs of matter whose emission color can be modified at will by simply varying particle size. This unique property has been already explored in commercial display technologies where quantum dots have expanded the palette of available colors. But the challenge is that most quantum dot lasers are limited to pulses of light lasting just a few nanoseconds — billionths of a second. The Toronto team overcame this problem by changing the shape of the quantum dots, rather than their size. They were able to create quantum dots with a spherical core and a shell shaped like a flying saucer — a ‘squashed’ spherical shape known as an oblate spheroid. The mismatch between the shape of the core and the shell introduces a tension that spreads apart the electronic states of the quantum dot, lowering the amount of energy needed to trigger the laser. As reported in today’s paper, the innovation means that the quantum dots are no longer in danger of overheating, so the resulting laser can fire continuously. The achievement of the lasing regime is also facilitated by unusually narrow emission linewidths of these quantum dots, revealed by single-dot spectroscopic measurements conducted at Los Alamos. This property increases the relative fraction of the dots participating in light amplification and helps further reduce the lasing threshold. Quantum dots have long been envisioned as highly flexible optical gain media for solution-processible lasers, able to easily access any desired optical wavelength across the entire range. “The dream of such lasers has motivated much of the research at the early times of quantum dot era in the ‘80s and the ‘90s, until it culminated in the first practical demonstration of the lasing effect by the LANL quantum dot group in 2000,” said Klimov. [link: http://science.sciencemag.org/content/290/5490/314]. This groundbreaking discovery has stimulated a flurry of follow up work, uncovering novel and exciting photophysics. So far, however, it still has not produced a practical commercialized technology. While techniques such as femtosecond pump lasers to outpace Auger recombination do work in the lab setting, they are too complex and expensive for real-life applications. 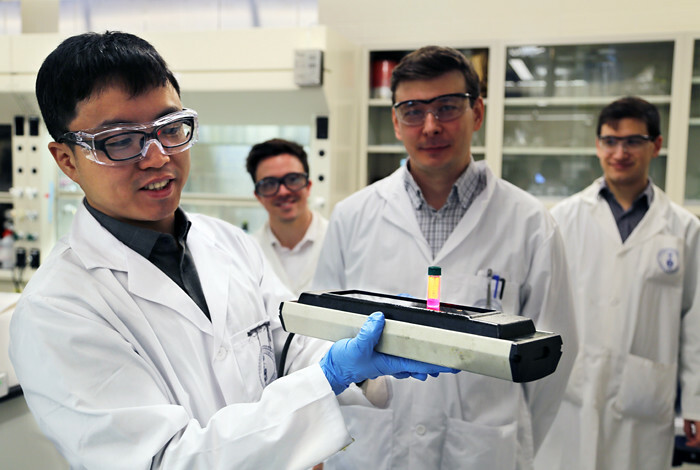 Therefore, the Toronto team’s demonstration of quantum dot lasing using steady-state but not pulsed excitation has been an important step on the way towards a practical lasing technology. The project included a number of national and international partners. Computer simulations in collaboration with the University of Ottawa and the National Research Council guided the design of the quantum dots. Analytical tests from Vanderbilt’s Institute of Nanoscale Science and Engineering in Nashville, TN, as well as the University of New Mexico’s Center for High Technology Materials in Albuquerque, NM and Los Alamos National Laboratory’s Nanotechnology and Advanced Spectroscopy Team (http://quantumdot.lanl.gov) confirmed that the final products had the desired shape, composition and behavior by analyzing individual quantum dots at the atomic level. Funding: The research of the Los Alamos team was supported by the Office of Basic Energy Sciences, Office of Science, U.S. Department of Energy. Located 35 miles northwest of Santa Fe, New Mexico, on 34.7 square miles of DOE-owned property. 1,280 individual facilities, including 47 technical areas with 9 million square feet under roof. 37% of employees live in Los Alamos, the remainder commute from Santa Fe, Española, Taos and Albuquerque. 98 miles; 1 hr, 51 min. Los Alamos National Laboratory, a multidisciplinary research institution engaged in strategic science on behalf of national security, is operated by Triad, a public service oriented, national security science organization equally owned by its three founding members: Battelle Memorial Institute (Battelle), the Texas A&M University System (TAMUS), and the Regents of the University of California (UC) for the Department of Energy’s National Nuclear Security Administration. Los Alamos enhances national security by ensuring the safety and reliability of the U.S. nuclear stockpile, developing technologies to reduce threats from weapons of mass destruction, and solving problems related to energy, environment, infrastructure, health, and global security concerns.